UT Arlington is one of more than a dozen universities selected for a White House initiative aimed at empowering teachers and students nationwide to use technology in the classroom. The ConnectED program partners with the online learning platform edX to offer free professional development courses and accompanying certification to teachers, along with courses to prepare students for advanced placement exams. A U.S. Veterans Affairs Department grant will enable UTA to increase opportunities for disabled veterans and armed forces members to participate in adaptive sports. 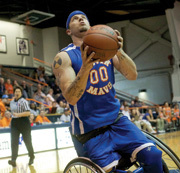 The funding will help the Movin’ Mavs wheelchair basketball team support camps, clinics, and program participation costs for veterans with physical disabilities. “Being able to provide this opportunity to our veterans is a great way for us to give back to those who have served our country,” Movin’ Mavs coach Doug Garner says. UT Arlington has been selected to participate in the Terry Foundation Scholarship program, the largest private source of scholarships in Texas. The program covers the full cost of attending college for 16 students beginning in fall 2015. UTA’s first class of Terry Scholars will come from 32 nominees to be interviewed by the Terry Foundation in April.